There's something brewing down in Columbus. Something I tried to tell myself that at first was ominous, unsettling. At first, I didn't like it, I hated it. I went against everything I thought to be right. I resisted my primal urges and incessantly denied myself the truth. But now that the first off-season of the Urban Meyer era at Ohio State is upon us, I've had a chance to reflect and truly understand, and accept the truth. The truth is that I was wrong. Dead wrong. Something has taken hold. Something that, years from now, we'll tell our children and our grandchildren about. Take notice my Maize & Blue brethren, we're witnessing history in the making. We are all witnesses. 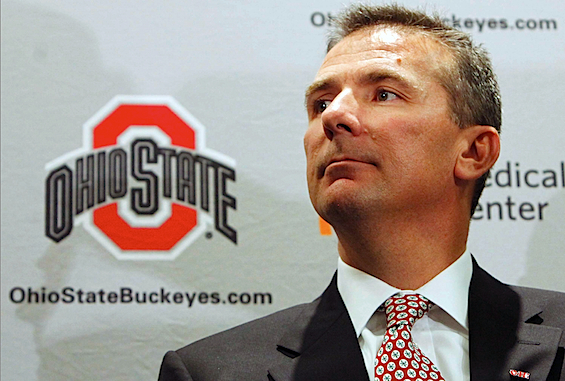 We are so lucky to have Urban Meyer in the Big Ten. We're so lucky to have such a pillar of the college coaching fraternity to look to for guidance and moral tutelage...to set the proverbial bar higher for the rest of the league. Honestly, I don't know how Brady Hoke and his fellow B1G coaches are going to be able to keep up. Since he took the coaching job at Ohio State, the most venerable coaching position in the country, he has raised the level of coaching and competition within the conference. But it's much bigger than that. No other coach in the league has a more realistic shot at salvaging the long and storied reputation of the Big Ten than Urban Meyer. No other coach can recruit like Urban. No other coach can beat the SEC like Urban. 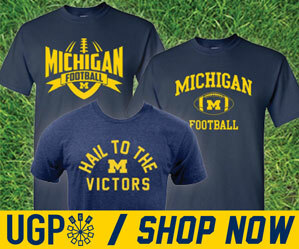 Urban owns Brady Hoke, with his 1-0 record, the history books are but written. Urban went 12-0 in his first season, but was denied a shot at a Big Ten title and national championship through no fault of his own...a decision that the NCAA surely regrets. In denying Ohio State a shot at a perfect season complete with championship rings and everything, college football fans as a whole were denied the chance to witness greatness. Instead, we got another ho-hum B1G championship game and another predictable national champion from the SEC. Save us from what we've for so long considered acceptable. We're not going to beat the SEC as a whole, we need one man, one coach to stand out and lead us. Lead us to glory Urban. We are all witnesses. Its been years since we could claim that the Big Ten as a great conference. With Penn State spinning their wheels with the Sandusky fallout/Paterno family and the NCAA and the legal debacle that is ensuing, mediocre coaches like Bret Bielema bolting his dream job at Wisconsin for Arkansas, and Michigan State losing all of their talented players to graduation or the NFL draft, what's left? Don't get me wrong, I love Michigan and I love Brady Hoke, but he's no Urban Meyer...the Recruiter, the Offensive Prognosticator, the Visionary, the Leader. Urban brings unparalleled success and championship rings to Columbus. He gave the world Tebow. Brady Hoke brought a sub .500 record with him to Michigan. That's it. Hoke wears short-sleeves in the cold. He's gruff. He says "Well" a lot. That's cute and all, but it's no Tim Tebow. The closest thing Michigan has is Greg Mattision, who was Urban's DC at Florida for a couple seasons. At least we have THAT! Ohio State isn't scared of Brady Hoke, short-sleeves and all, or Michigan. Not with their savior, Urban Meyer at the helm. He's as close to a 'can't miss' as there is. For how much Jim Tressel owned Michigan, that was simply just a taste of what the Urban Meyer era will be like. It's not a question of if he'll dominate Michigan, it's for how long. It's the Urban Meyer era at Ohio State that will define this conference, and maybe college football as a whole for as long as Urban chooses grace us with his presence. The Michigan's of the world can only hope for second place, and take notes along the way. Urban, I'm truly sorry for doubting you. I apologize for those things I said about your health and the way you left Florida for ESPN. Surely, it was wrong of me to assume those things. I am aware now. I understand now. We are all witnesses. It's now the Big 1 and the Little 11. I simply just hope that when it's all said and done, your statue outside of Ohio Stadium honestly and accurately depicts and pays homage to your contributions to not only Ohio State, but college football as a whole. Update: Does this post confuse or upset you? Read this.